If peanut butter is your thing then this tower is built for you. We start with 2 each Milk, Pearl White and Dark Chocolate Peanut Butter Cups topped with Peanut Butter and Peanut Butter Chocolate Pralines. The next box has our homemade creamy Peanut Butter and Peanut Butter Chocolate Fudge. Then we add a layer of 2 each Milk, Pearl White and Dark Chocolate Peanut Butter Ritz Crackers followed by Peanut Butter Truffles and last Chocolate dipped Nutter Butters. Now that’s a lot of Peanut Butter. These are a few of our favorite things. And once you taste them, we’re sure they’ll become your favorites too. 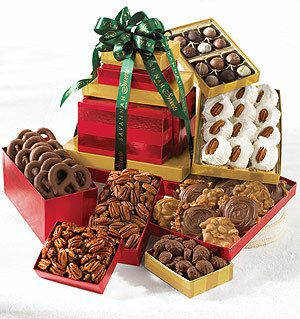 Our candymakers stack this tower with a dozen Milk Chocolate Pecan Clusters, followed by a tin with a Praline, Milk Chocolate Pecan Paw™, Glazed Pecans and Sugar & Spice Pecans, then top it all off with a box of Assorted Truffles. The most tasteful way we know to celebrate any occasion. 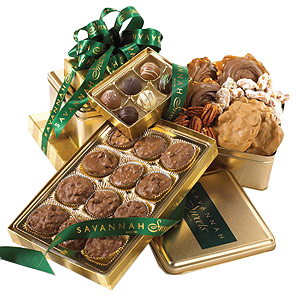 Tower begins with Milk Chocolate Pecan Clusters and works its way up with Pearl White and Dark Chocolate Drizzled Caramel Popcorn, Roasted Salted Mixed Nuts, creamy Chocolate Fudge, and a tin with Glazed Pecans, Sugar & Spice Pecans, a Praline, and a Milk Chocolate Pecan Paw™. Triple their pleasure with three of our most popular treats. 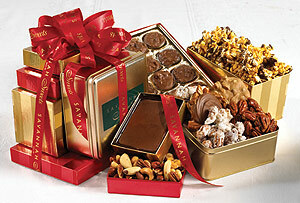 These golden gift tins include our delicious Southern Pralines, Glazed Pecans and Sugar & Spice Pecans. 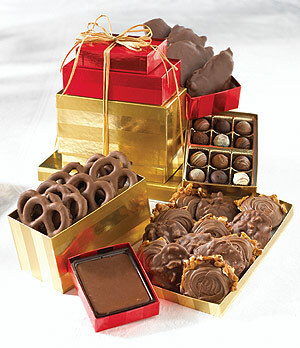 Here’s an impressive gift that’s sure to stack up among their all-time favorites. 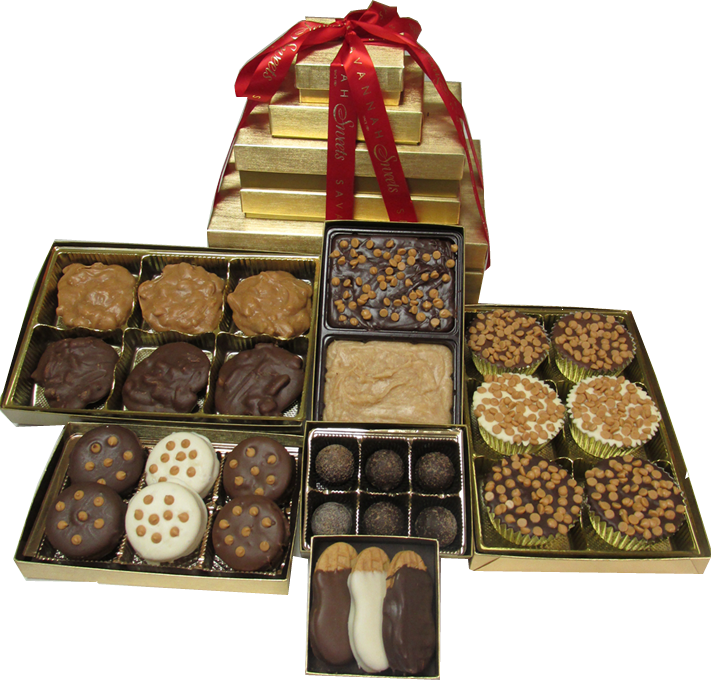 Bottom box holds an assortment of our Pralines and Milk Chocolate Pecan Paws™. 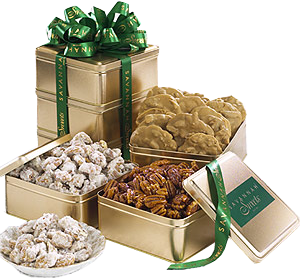 We follow that with Divinity, Assorted Truffles, Milk Chocolate Pretzels, Roasted Salted Pecans, Glazed Pecans and, on top, a box of Milk Chocolate Pecans. Tower may vary slightly in style May through September. 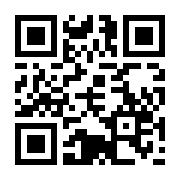 This is a perishable product and requires an extra $5 in shipping charges May through September. When one gift just won’t do, surprise them with this flavor-filled tower. 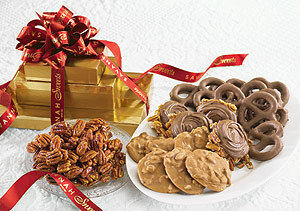 This bountiful assortment begins with a box of Pralines, Milk Chocolate Pecan Paws™ and Divinity. 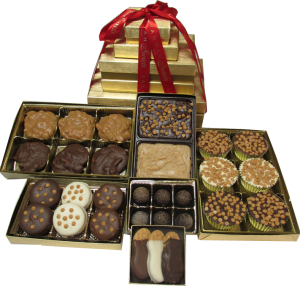 Next up are boxes of assorted Truffles, Milk Chocolate Covered Pretzels, Glazed Pecans and, atop it all, Milk Chocolate Covered Pecans. Tower may vary slightly in style May through September. This is a perishable product and requires an extra $5 in shipping charges May through September. We take gift giving to new heights! 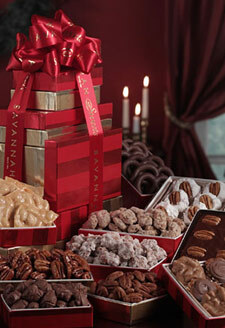 Our golden tower of treats features box after box of your favorites including Pralines, Milk Chocolate Pecan Paws™, Divinity, Chocolate Pecan Fudge, Praline Covered Pecans, Peanut Brittle, Sugar & Spice Pecans, Milk chocolate Pretzels, Roasted Salted Pecans, Glazed Pecans and Milk Chocolate Pecans. Tower may vary slightly in style May through September. This is a perishable product and requires an extra $5 in shipping charges May through September. ToIt’s a towering trio of treats everyone will love. 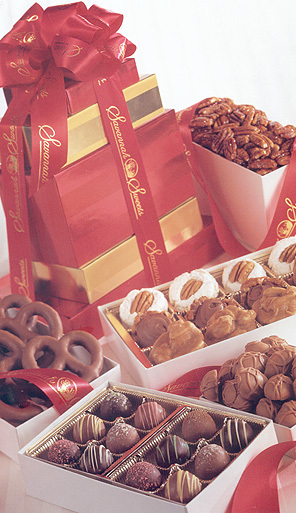 Tower starts with a box of Milk Chocolate Pecan Paws™ and Pralines, then adds a box of Milk Chocolate Pretzels, and is topped off with a box of Glazed Pecans. From top to bottom, it’s one tasteful treat after another! Towers may vary in style May through September. This is a perishable product and requires an extra $5 in shipping charges May through September.